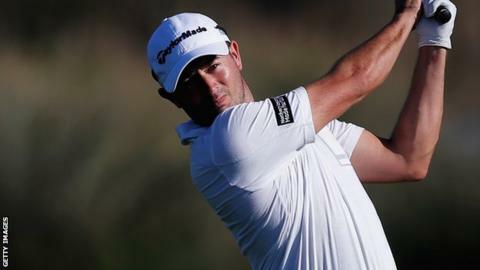 Gareth Maybin made the cut at the Alfred Dunhill Championship in South Africa despite posting a disappointing second round of three-over-par 75. The Ballyclare man carded two birdies, three bogeys and a double bogey in his round and ended the day in a tie for 49th place on level par. Maybin was joined on that score by Irish players Damien McGrane and Kevin Phelan, but Michael Hoey withdrew. Orum Morten Madsen and Charl Schwartzel lead the field on eight under. Ross Fisher and Soren Hansen are one shot off the lead, with Tyrone van Aswegen and Richard Finch a further stroke back. Maybin began the day just four shots off the lead after an opening 69 on Thursday, but a disastrous run in his first nine on Friday saw him drop five shots in eight holes from the 10th to the 17th. Birdies at the 18th and the seventh saw him finish on the halfway cut mark. Hoey failed to complete his second round, withdrawing after the turn. New professional Phelan, 23, is competing in his first European Tour event since securing a card at the recent Tour School Finals. New York-born Phelan made the cut at this year's US Open and also represented Great Britain & Ireland at the Walker Cup. Fellow Irishmen Peter Lawrie and Simon Thornton failed to make the cut after lying on four over and five over respectively. The 2014 European Tour event is being played at the Leopard Creek course in Malelane. Denmark's Orum Morten Madsen is aiming to complete a notable double, having won the South African Open Championship last week.